Procession of the Nobles (Cortege from the Opera Mlada). Composed by Nikolay Andreyevich Rimsky-Korsakov (1844-1908). Edited by Van B. Ragsdale. Arranged by Erik W. G. Leidzen. Concert Band. For Flute I, Flute II, Flute III, Piccolo, Oboe I, Oboe II, Clarinet (in Eb), Clarinet I, Clarinet II, Clarinet III, Alto Clarinet, Bass Clarinet in Bb, Bassoon I, Bassoon II, Alto Saxophone I, Alto Saxophone II, Tenor Saxophone, Baritone Saxophone, Bass Saxo. 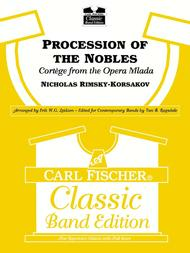 This edition: A Carl Fischer Classic Band Edition, New Repertoire Edition with Full Score. Carl Fischer Classic Band Editions. Score and Set of Parts. Standard notation. 32 pages. Published by Carl Fischer (CF.J739).ISBN 0825810558. With Standard notation. 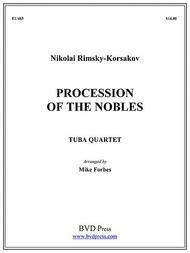 Procession of the Nobles composed by Nikolay Andreyevich Rimsky-Korsakov (1844-1908). Arranged by Jay Bocook. For Concert Band. MusicWorks Grade 3. Grade 3. Score and parts. Published by Hal Leonard (HL.26423039).Rimsky-Korsakov's symphonic masterpiece is made playable by Jay Bocook with this special edition for concert band. With its brilliant brassy fanfares and rhythmic vitality, this symphonic movement is a superb choice for a contest opener. 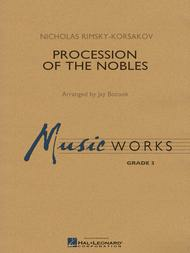 Procession of the Nobles composed by Nikolay Andreyevich Rimsky-Korsakov (1844-1908). Arranged by Forbes. For Tuba Quartet (EETT). Published by Music Express (MI.EU403).